So, on to what we have here: a four-song EP from 2002, featuring a different, longer version of the title track than the one that eventually appeared on her (also self-titled) debut full-length three years later. The other tracks are "The Car Song", a version of "Bye Bye Blackbird", and "New York, New York, New York". 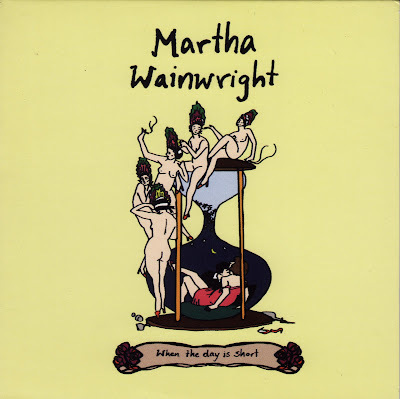 I've also added Martha's great version of the latter-day Warren Zevon tune, "I Was in the House when the House Burned Down", which was released on her UK single for "When the Day is Short"
Check out Martha's great recordings right here . I first saw Martha several years ago in Newark, Nottinghamshire when she was playing support to her father. She was wonderful, much better than him! Thanks for this! Saw Martha supporting her father about five years ago. She was excellent ... almost as good as him ... but nowhere near as good as he was at her age. IMO Loudon today is BETTER than he ever was when he was Martha's age! He's doing some of the best work of his career, tackling age-appropriate if dark topics like mortality (one's own and that of one's parents), loneliness, failing health and the like, with the same UNfailing confessional honesty and fearlessness that's always been his hallmark. To prove it, listen first to the exquisite "White Winos", from his 2001 album, Last Man on Earth. And see the man live if he is anywhere in driving distance. His is a late-career renaissance that's the singer-songwriter equivalent to the not-dissimilar author Philip Roth (to prove THAT, read Sabbath's Theater, and American Pastoral).I might just have to post something of his on here, if I can find something in my collection that's not elsewhere online. Agree that LW3 is still writing great songs, but he's been writing them since at least 1983 (Fame & Wealth) which must have been about Martha's age now?. And back then they were fresh and original and his live show was devastating. He's still great, but the themes/tunes/tics are getting a little tired now both on record and especially on stage. But agree he's still better than almost anyone out there of any age. 83? That means the Dead Skunk was actually ten years younger than previously believed...and no flouride (just cats, dogs, toadfrogs, rabbits and raccoons). It might smell a little, but that's longevity for ya! I first saw Martha singing backup on her brother's early tour of the south, back in... 2002 or so? She opened for him solo, then came back out to sing backup. Stellar! Hi there, I'm wondering if anyone would be so kind as to re-upload these rarities? Thanks!